Lightning's Girl: I can't imagine Peter Saville approves of this! Here is the quote from the Disney Store website. 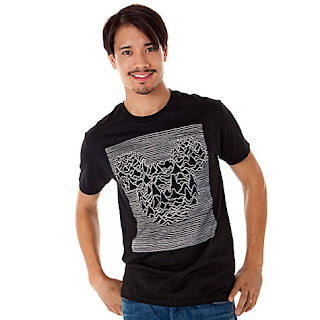 "Inspired by the iconic sleeve of Joy Division'sUnknown Pleasures album, this Waves Mickey Mouse Tee incorporates Mickey's image within the graphic of the pulse of a star. That's appropriate given few stars have made bigger waves than Mickey!"